For the fourth consecutive quarter, Philip Morris (NYSE:PM) beat earnings estimates. The New York-based international tobacco company reported higher-than-expected numbers on both the top and bottom lines. Although both profits and revenue fell on a year-over-year basis, investors reacted well to the news, bidding PM stock higher each of the following two days. However, with its high dividend, most investors focus on the payout. The generous yield, along with the 11-year streak of increases, has drawn investors into Philip Morris stock since the beginning. However, investors may want to approach PM stock dividend cautiously, as it faces an unexpected danger. For the fourth quarter, the company reported non-GAAP earnings of $1.25 per share. This came in eight cents ahead of analyst expectations. Despite the higher-than-expected earnings, it still represents a year-over-year drop as PM earned $1.32 per share in the same quarter last year. Revenues of $7.5 billion also beat estimates by $110 million. Still, they fell by 9.5% from last year’s $8.29 billion in the year-ago quarter. Investors took the news well as PM stock rose by about 1.6% in Thursday trading. It increased by an additional 4.2% on Friday. Much like its former parent Altria (NYSE:MO), PM stock has dealt with the poor reputation and the marginalization of its core product. However, PM tends to maintain its profit growth. The company has also introduced IQOS, a “heat, not burn” smokeless product. It plans to ultimately replace cigarettes with IQOS in the coming years and that may boost profits as well. PM has also maintained steady growth is in its dividend. The company has increased the payout every year since its split off from Altria in 2008. The annual payout for this year will amount to $4.56 per share. This gives today’s buyer a yield of about 5.7%. The PM stock price has grown by only 150% of its value since the March 2009 low. Since this significantly lags the 345% increase seen in the S&P 500 over the same period, most stockholders own PM for its dividend. Here investors need to exercise caution. Activists have long targeted tobacco and have increasingly disliked PM’s smokeless alternative. However, the most immediate danger to PM does not lie there. The near-term threat with PM stock lies in its dividend payout ratio — the percentage of net income paid out in dividends. The dividend payout ratio has risen to over 85%. Consumer defensive issues like Philip Morris stock tend to maintain higher payout ratios. However, even in PM’s sector, they typically remain well under 85%. The company’s reduced profit should cause concern. If that pace were to continue, PM could place itself in a position where it pays out more in dividends than it earns. Fortunately, analysts believe it can avert this fate. Wall Street forecasts an average growth rate of about 6% per year over the next five years. Alternative lines of business also remain an option. IQOS receives most of the attention in that area. Also, much like Altria invested in Cronos (NASDAQ:CRON), it could enter the cannabis sector. 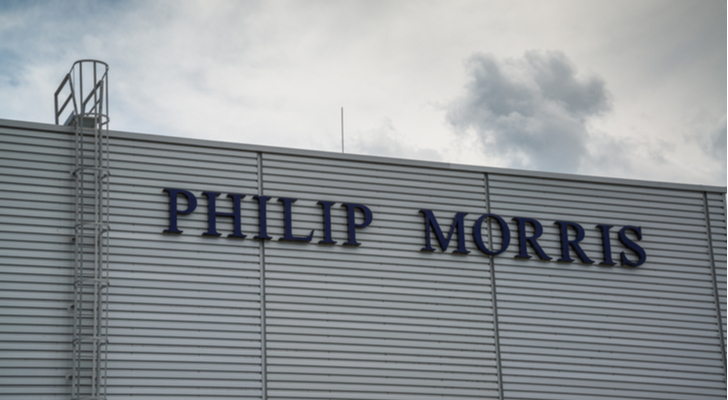 Philip Morris has so far given no indication it has such plans. Still, unless PM sees higher levels of profit growth, dividend growth should remain a major concern. If Philip Morris reports lower revenues and profits, I would recommend getting out before the inevitable dividend cut. The dividend payout ratio on PM stock poses a more immediate threat to the equity than the reputation of its core product. Philip Morris continues to earn profits. However, the company reported lower profits than last year. This creates a precarious situation, as the company tends to increase its dividend annually and pay out nearly all of its profits in the form of dividends. Any interruption to these increases will devastate PM stock. For now, analysts expect profit growth to resume. It has invested heavily in its smokeless product and, like its U.S.-focused counterpart, it could also enter the cannabis market. However, profit growth has become paramount. If profits continue to fall, investors need to smoke PM stock out. Article printed from InvestorPlace Media, https://investorplace.com/2019/02/unexpected-danger-smoke-philip-morris-stock-fimg/.